Although the 55m hurdle favorite and LL winner Tess Stapleton of Ludlowe comes in as the top seed at 18-00.25, both S winner Chelsea Mitchell of Canton with an 18-8 top mark and M winner Nyimah Ambrose of Hillhouse at 18-0.75 have gone a bit further. Also in contention are LL runner-up Selina Soule of Glastonbury at 18-0 and L winner Erica Marriott of North Haven who has gone to 17-10.75. 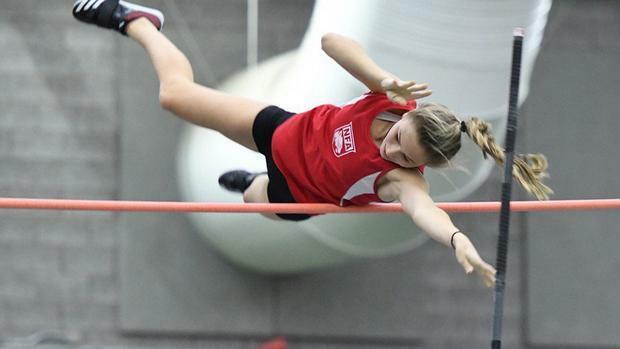 Class M winner Patricia Mroczkowski climbed to 5-06.25 to grab the top seed in the high jump. A fraction behind her is last year's winner and LL champ Ally Lewis of Norwich FA. Tianna St. Louis of Tolland took 2nd in Class M and is the only other jumper who is within two or so inches of the top two. Top seed and Class LL winner Paige Martin of Norwich Free Academy has actually cleared 5 inches higher than her seed height and is at 11-8. M winner Elise Russell of Weston and S champ Cate Coppes of Old Saybrook both scaled 11-0 to win last weekend. There could be another sister act going on for the CIAC as happened in the Class LL meet since NFA's Madison Martin has the 4th seed at 10-6. Alliya Boothe of Bloomfield went to 43-11 to win Class S, which is more than 8 1/2 feet further than she threw last year in a 10th at States. Trinity Cardillo of Southington hit 39-6 to win Class LL, Natalie Rolon of Bacon Academy won Class M at 39-5.25 but has thrown 42-1 this year. Sydney Mello of Lewis Mills threw 39-2 in Class M, and Class L winner Susie Okoli of Wilbur Cross has gone to 39-10. Another big threat to Boothe could still be last year's 4th place finisher, Hillhouse sophomore Leah Moore, who is seeded 10th but has a 41-9 throw from the Rhode Island Classic.